2pcs NICHICON KG GOLD TUNE 22000uF 63V GENUINE JAPAN HI END AUDIO CAPACITORS! 8PCS NOS FRAKO 470uF 25V HI END TUBE AMP CAPS FOR AUDIO! 100x NOS 1N60 Germanium Glass Diodes 1K60 THOMSON-CSF FOR AUDIO ! 100x VISHAY DRALORIC WK2 GENUINE 43K2 1W 1% METAL OXIDE RESISTORS FOR TUBE AMP! 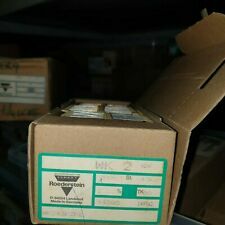 100pcs NOS PANASONIC ECQ-M 2200pF 2.2nF 0.0022uF 50V HI END CAPS FOR AUDIO ! 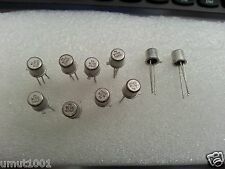 10pcs NEW VISHAY ERO KP1830 0.01uF 10nF 63V (MKP1837) HI_END CAPS ! 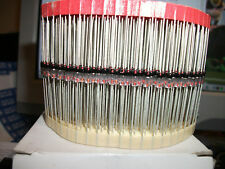 20PCS NOS PHILIPS 0.033uF 33nF 250V AC MKT 311 X2 HI END RFI CAPS FOR AUDIO ! 8pcs NOS 10000pF 63V 10nF 63V HI END POLYSTYRENE CAPS FOR AUDIO! 3PCS NOS SPRAGUE 7D 47uF 350V 19x43mm HI CURRENT HI END CAPS FOR AUDIO! 10pcs NEW VISHAY ERO MKT1820 22uF 63V HI END AUDIO CAPS ! 1pc NOS ROE GOLD EYM/A 80uF 450V AUDIO GRADE LOW ESR HI-END CAPACITOR ! 2PCS NEW KENDEIL K05 15000UF 63V 35x50mm CAPS AUDIO QUAD 405 UPGRADE NAIM AMP ! 100pcs NEW ROE MK2 6R65 1% 50ppm 0.6W HIEND METAL FILM RESISTORS FOR TUBE AUDIO! 8X NOS ROE EG GOLD 385v 22uf AX AUDIO GRADE TUBE AMP CAPACITORS ! 2PCS NEW KENDEIL K01 10000UF 63V CAPS AUDIO QUAD303 QUAD 405 UPGRADE NAIM AMP ! 3000pcs NEW VISHAY SMM 0204 25PPM 22K3 0.1% HI END PRECISION MELF RESISTORS ! 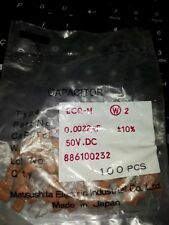 20pcs NEW 100UF 100V BC VISHAY 021 ASM HI END AXIAL Capacitors FOR AUDIO! 6pcs NOS ROE GOLD EB 10uF / 100V 105C 8.5x18mm HI END Axial Caps FOR AUDIO! 2x NEW 6800UF 63V VISHAY 256 Power Miniaturized HQ CAPS FOR AUDIO ! 4x NEW 4700uF 40V BC VISHAY 050 VERY LONG LIFE CAPS FOR AUDIO !! 6pcs GENUINE WIMA TUBE AMP MKP10 0.22uF 220nF 630V 22.5mm HI END AUDIO MKP CAPS! 2pcs PHILIPS 057 series 220UF 450V LOW ESR L.L HI_END TUBE AMP CAPS FOR AUDIO !! 100pcs NOS UNITRA MIFLEX 560PF 160V axial STYROFLEX POLYSTYRENE HIEND CAPS ! 20pcs GENUINE NEW WIMA MKS2 0.47uF 50V - 470nF 50V 2.5mm CAPS FOR HI_END AUDIO ! 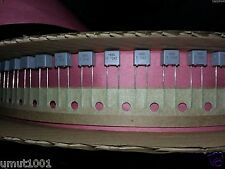 30pcs VISHAY UXB207-05 122R5 0.1% 5ppm High Precision ThinFilm Leaded Resistors! 50pcs NOS MULLARD MUSTARD CAPS 150nF / 0.15uF / 100V GREAT DEAL ! GUITAR TONE! 1PC NOS ROE EBU BIPOLAR 47uF 40v HI_END Tube amp CAPACITOR FOR NAIM AUDIO ! 4x NEW ERO MKT1813 0.15UF 630V HI END CAPACITORS 10% FOR TUBE AUDIO ! 3000pcs NEW VISHAY SMM 0204 15PPM 2K61 0.1% HI END PRECISION MELF RESISTORS ! 4pcs VISHAY DRALORIC G204 100R 7W 2% HIEND VITREOUS TUBE AMP RESISTORS!MARSHALL! 4pcs NOS PIHER GENUINE 470K 1/2W CARBON RESISTOR FOR MARSHALL V.OX AMP ! 10pcs SPRAGUE 150D 47uF 20V TANTALEX HI END AXIAL TANTALUM CAPS FOR AUDIO! 4x NEW 5600UF 80V VISHAY 256 Power Miniaturized HQ CAPS FOR AUDIO ! 10x NEW VISHAY DALE RH-5 15K 5W 5 Watts 1% HI END Resistors for Audio! 10PCS NOS GERMANY 100pF 0.1nF 400V 1% HI END POLYSTYRENE CAPS FOR RIAA AUDIO ! 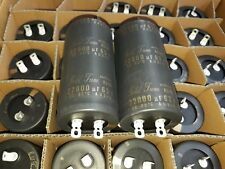 16x NOS ROE GOLD EKR 47uF 25V 105C LONG LIFE AUDIO GRADE HI-END CAPS ! 10x NEW DALE RLR32C2001GR 2K 1W 2% HI END RESISTORS FOR AUDIO ! 4pcs NEW VISHAY BC PHILIPS 138 1000uF 63V HI_END AXIAL CAPS FOR AUDIO ! 500x BC VISHAY MKT 368 0.33uF 63V 10mm ORANGE DROP GUITAR TONE CAPS FOR AUDIO ! 20PCS NOS NICHICON PJ 22uF 100V 105C LOW ESR JAPANMADE LONG LIFE CAPS FOR AUDIO! 1pc NOS BIANCHI MULLARD MUSTARD 1uF 160V HQ CAPACITOR - GREAT MARSHALL TONE ! 2x NEW 5600UF 80V VISHAY 256 Power Miniaturized HQ CAPS FOR AUDIO ! 4pcs NEW 22000UF 25V VISHAY 256 105C Power Miniaturized HQ CAPS FOR AUDIO !